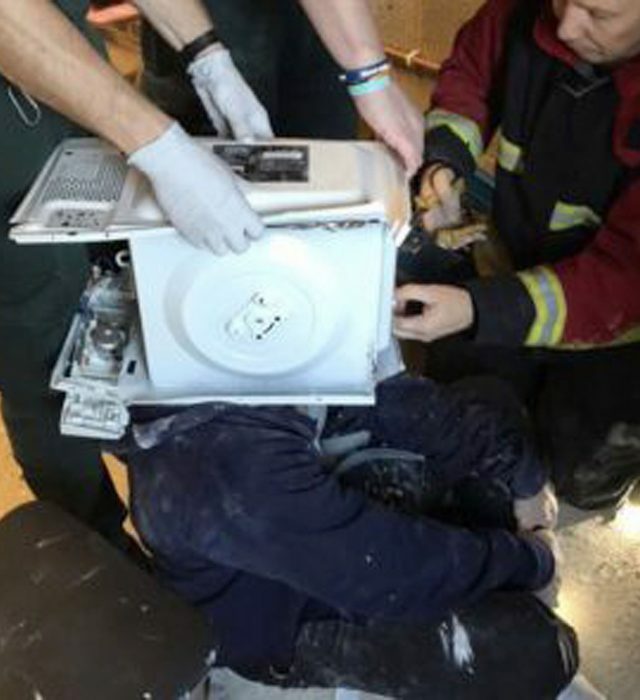 Five firefighters spent an hour working to release a YouTube prankster who cemented his head inside a microwave. The 22-year-old and a group of friends mixed seven bags of Polyfilla before they poured it around his head, which was protected by a plastic bag inside the appliance. Their intention was to use the microwave as a mould, and by the time emergency services were at 1.49pm on Wednesday to the garage of a house in Fordhouses, Wolverhampton, the group had already been trying to free him for 90 minutes. The friends had managed to feed an air tube into the man's head to help him breathe. Watch Commander Shaun Dakin, officer in charge of the West Midlands Fire Service crew who responded, said: "As funny as this sounds, this young man could quite easily have suffocated or have been seriously injured." He added: "Taking the microwave apart was tricky, because a lot of it was welded. "We video-called our technical rescue colleagues for advice and eventually managed to get him unstuck. "He was very relieved when we removed a large chunk of the Polyfilla with a screwdriver, allowing him to breathe more easily. But we had to be extremely careful with the screwdriver, working so closely to his head. "It took us nearly an hour to free him. All of the group involved were very apologetic, but this was clearly a call-out which might have prevented us from helping someone else in genuine, accidental need."